This unit’s long range is 5-16 hexes. This unit gets –1 on each attack die. This unit's attacks ignore cover. This unit can't attack Aircraft. Q: The German Wespe, US M4A3 (105) Sherman, US M7 105mm Priest and the Soviet SU-152 have the Bombardment special ability, which allows them to ignore cover. What happens if any of these tanks attacks a unit with the superior camouflage special ability? Could this unit be bombarded at medium and long ranges? 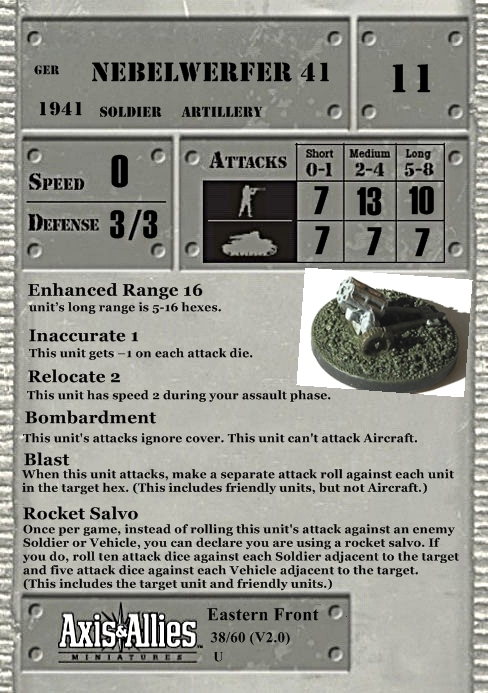 Q: Can units with the Bombardment SA use it to attack Aircraft? A: No. According to the 11/12/09 clarification, both of these units' Bombardment SA should include "This unit can't attack Aircraft." GMC, the British have the Churchill AVRE and the Soviets have the BM-13 Katyusha Rocket Launcher and SU-122. All of these units also have the Bombardment SA. Q: A rifleman is sharing the same hex with a Fanatical/Expert/Imperial Sniper. A Brummbar tank is four hexes away and decides to target the rifleman. Does the sniper take damage from the Blast targeted at the rifleman located in the same hex? A: Yes. The Blast gets the sniper too. Q: Assume a tank with the Blast special ability is firing at a vehicle with a Soldier riding along as a passenger. The Blast effect requires attacks against all units in the hex, even friendly units. Is a separate attack made against the passenger, in addition to the vehicle? A: Yes. Blast affects every unit in the hex, including passengers aboard a Transport. The Soldier would be the target of a separate attack roll. Q: Does Blast affect Aircraft? A: No. You can't attack an Aircraft with the Blast ability and you also can't make a separate attack as one of the Blast ability's separate attacks. Q: An enemy Soldier is in the same hex as my tank with the Blast SA. If I decide to attack that Soldier, does the tank have to roll an attack against itself being that Blast affects every unit in the targeted hex?